Some historians admit the existence on Canary Islands of dogs resembling by description Perro de Presa even in times of the islands settlement by Celt Iberians, long before Rome conquest of Spain. First historical mentions about remote ancestors take their origin in times of the reign in Mauritania of king Juba, about 50 years B.C. Historians described the fact of dispatch by the king of Mauritania to Canary Archipelago of the small group of people for territory study. From their trip people brought to their king foreign creatures that impressed their imagination – two huge dogs. According to remained historical descriptions that dogs resembled Perro de Presa and impressed Mauritians by their big size, strength, severe temper and barking freezing their hearts. In times of Frenchmen dwelling on the Islands we could find the description of dogs they found on Tenerife Island. But this description doesn’t resemble the dogs brought to the king of Mauritania. Frenchmen described seen dogs as strong, vigorous, sturdy, and not tall. These dogs almost always accompanied local tribes. In historical data of XVI and XVII centuries we can find many citations and memoirs related to Perro de Presa. That is proved by historical documents appeared after the conquest of Canary Islands. Decrees concerning Perro de Presa and Perro de Ganado (Majorero) were issued. Perro de Ganado could be taken only in herders’ possession to be used for cattle herding. The next resolution concerned Perro de Presa, only butchers could keep these dogs, Presa dogs were used for slaughter. The resolution said that the dogs had to be chained at day and at night and let loose only to fulfill their duties. Peasants used Perro de Presa as guard dogs and to kill stray dogs that caused trouble for local people. In 1526, the town council of Tenerife Island by its resolution issued a decree about killing of Perro de Presa because of damage they caused to cattle and domestic animals, except a pair of dogs intended for butchers servicing. This mission was given to Don Pedro de Lugo who had trained Perro de Presa. During XVII century over an over English colonists appeared on the Archipelago. They brought with them English port traditions related with dog fighting and dogs of fighting breeds. Dogfights were carried out on the Islands during long time. For dogfights there were usually used dogs-gladiators such as bulldogs or pit bull terriers, imported to the Islands by Englishmen, and their crossbreed with Perro de Presa living on the Archipelago was inevitable. Thus a breed with definite morphological features appeared on Canary Islands. It concerns not only Perro de Presa served for guard and cattle herding, but also those of them that had features appropriate for the participation in dogfights such as quickness and adroitness, fearlessness in fight, great physical strength and incredible persistence. The representative of Canary breed of dogs, Perro de Majorero, mostly defines genetic code of Perro de Presa Canario with their external figure and greenish tiger color typical for them. During XVIII century the interest to dogfights increased. Dogs taking part in fights were selected by their fighting capabilities rather then breed characteristics. In such situation Perro de Presa was chosen taking into account its functionality. In other words it was ethnic group with best characteristics had been developed on the Islands since ancient times, but there were no considerations concerning the phenotype might be really peculiar to Perro de Presa. After the prohibition of dogfights in Spain, fighting breeds of Canary Islands stopped their development that caused to almost complete dying out of these dog breeds by 1960. However in 1970 the breed of Perro de Presa Canario began to revive. This recovery was slow but uninterrupted. The interest to Perro de Presa Canario as to the integral part of inheritance of Canary Islands was general. At the same time an urgent program on breed selection and deepening was developed in order to get genetic stability of Perro de Presa Canario. Livestock of Perro de Presa on Canary Islands has been notably increasing since 1970. This breed of dogs used in the past for cattle herding and peasants’ needs began to be used as guard breed in town environment, it permits to introduce it into other social areas to be spread faster. In 1982 a group of cynologists from the Island Tenerife, responsible for the large part of Perro de Presa Canaio for that moment, established Spanish Club of Perro de Presa Canario due to the authorization of Central Royal Association of dogs breeding in Spain. Spanish Club Perro de Presa Canario represented glaring representatives of this breed at national exhibition on the Island Tenerife in 1985 as restored Spanish breed, and also at International exhibitions in Los Angeles in 1985-1986. Fist Regional Exhibition of Perro de Presa Canario took place on October 19 of 1986 in Santa Cruz de Tenerife. At the Exhibition 150 representatives of this breed of dogs were exhibited. They were described by the Commission on dog breeds research; the description contained their morphological characteristics and character. In order to study the breed in the province Las-Palmas Spanish Club Perro de Presa Canario carried out Second Regional exhibition in June 6, 1987, in the town Gia de Gran Canaria, where there were described 80 representatives of this dog breed mainly from such families as Grancanarias de Gia, Galdar, Arucaz, Firgaz. Two more Regional Exhibitions were conducted with purpose to study available potential of the breed by the Commission of Spanish dog breeds’ study, and also to establish the standard of given breed. With this aim Central Royal Association requested to Madrid two representatives of Perro de Presa Canario from each Canary province. These representatives of the breed were officially presented at International Exhibition in autumn of 1987. Commission on Spanish dog breeds drew up corresponding documentation on given breed standard study, which included physical and psychological data on Perro de Presa Canario. This continuous work was completed with acceptance and approval by the Association of official standardization of breeds. This official approval of Perro de Presa Canario standard was announced on 24 of January 1989. With the beginning of official restoration of Perro de Presa Canario the Club started to distribute and strengthen the breed, permanently improving genetic fund. This mission was to difficult taking into account an island origin of the breed focused in two the most important places of Perro de Presa Canario location -Tenerife Island and Gran Canaria Island. In 1993 on the territory of the country the possibility appeared to establish a jury, to select specialists in order to register every year thoroughbred Perro de Presa Canario for international exhibitions in Madrid and demonstration of Spanish breeds in other countries. Spanish Club Perro de Presa Canario promoted the breeds by means of national specialized exhibitions. The main purpose of these annual exhibitions is to study morphology and temperament of present generation in order to continue improvement its breed characteristics. 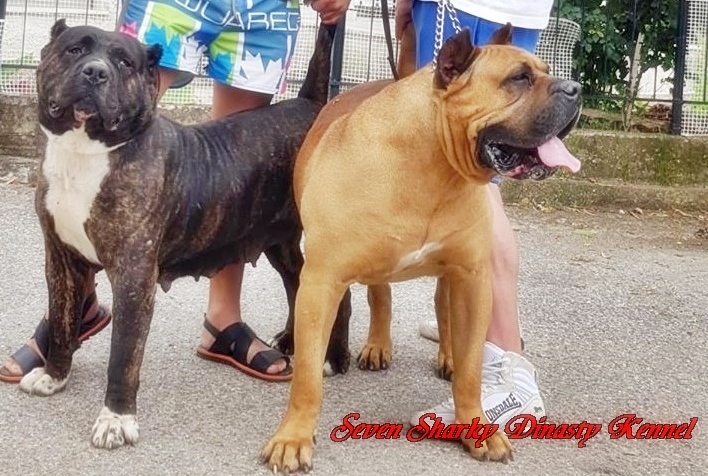 Due to purposeful activity of Spanish Club Perro de Presa Canario the breed number has increased as much so dogs of this breed justly enjoy wide popularity in many European countries and first of all in USA. On 4 of June 2001 the breed won the recognition of International Cynological Federation and approval of breed standard of Dogo Canario FCI 346.